Every child who wears glasses will know just how Arlo feels, and will feel better because of it. And every parent will want that child to know that glasses are cool and fun and enable us to do the things we want to do. Take Arlo: He's a shaggy, free-spirited dog who loves to play catch, until one day he can't. He can't see the ball anymore. 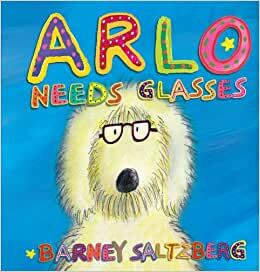 He needs glasses In this inventive, interactive picture book created by Barney Saltzberg, the bespectacled author of" Beautiful Oops ," who charms young readers and their parents with a perfect light touch and joyful spirit, kids get to do just what Arlo does to solve his problem. They read an eye chart, look through a fold-out phoropter (that big machine optometrists use), and try on different pairs of glasses--movie star glasses superhero glasses mad scientist glasses And they interact with Arlo as he rediscovers how to be the best ball-catcher in the neighborhood and picks up a new favorite pastime along the way--reading One out of five school-age children needs glasses. Arlo will show them just how lucky they are. I bought this book when I found out my 3 year old son needed glasses. It really helped! It has an engaging story and makes getting glasses a little more fun. The interactive parts of the book were a plus, especially the different pairs of glasses not only for Arlo to try on, but my son too! After 3 years, this is still one of my son's favorite books. He's taken good care of it, but it's starting to show wear from so much use. I'm going to surprise him with a new copy. Edit: I originally rated this 5 stars, but knocked it down to 3 after I received the new version of the book. My son was so disappointed that the book was changed from the original. There is no longer a pull-out phoropter, just a flap to lift. The last page no longer has a pop-up of Arlo's favorite books, just a flat illustration. I'm planning to return it. My soon to be 5 year old Twin Grandson & Granddaughter recently got glasses. One is taking to them well and one is not. The BIG 5 year Birthday is this month and Kindergarten is just around the corner. 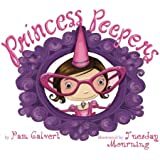 I purchased this book to go along with specialty T-Shirts I had made for them of their favorite animals wearing glasses. This book is well made, super Adorable and has pop ups and fun interactive things that they are going to love. They LOVE books and have quite a collection and I think Arlo is going to be a Super Big Hit.. he was with me! When we found out that my son was getting glasses at 3 years old we were anxious. His Grandma sent us this book, and it made the transition to glasses so much easier. My son loved the character Arlo, who is very cute. The book also is very fun because it has pop out pages and folders where you can take out different kind of glasses and try them on Arlo. 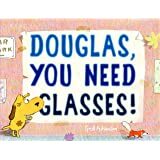 Buy the book and read the book a couple of nights before your child gets the glasses because it is capable of making your child excited about getting glasses as it did ours. On top of that... he has had the glasses for over a month and he still loves the book! Please bring back the version of this book shown in the media trailer that has the pop up of books at the end and the phoropter with the folded pull out. We love this book but these two changes make this book incomplete and frankly seems as if the publisher cheaped out. I almost did not but this book as I thought it was too young for my almost year old. Boy was I wrong! She LOVED LOVED LOVED it! It is fun and interactive. We read each page several times and laugh as we do. I would HIGHLY recommend this for any little one between probably 2 and 6 years old! A must have even early on in the glasses adventure as you try to find the perfect fit!